It's pretty easy to find marketing applications for Twitter, but what about sales applications for the little blue bird? Are there any? Besides the fluffy and non-specific things like, "engage with leads" that we hear about all the time? Actually, yes -- Twitter can be a very powerful nurturing tool for a sales organization. And we thought there should be a fluff-free process people could implement to use Twitter to connect with prospects at a higher rate. So I sat down with Pete Caputa, one of our HubSpot sales directors, to learn more about how he uses Twitter to engage with prospects and close more deals. Here's how you or your sales reps can use Twitter to warm up prospects, build rapport, establish thought leadership for your company, and ultimately connect with prospects that turn into paying customers. The first step is to do some research on who your prospects are on Twitter, and what they’re talking about. There are a couple ways to do this: You can simply take your existing prospect list and search for them on Twitter, or you can type in relevant keywords into Twitter’s search function to find possible targets. From there, you can follow them and/or add them to a Twitter list for easy organization and tracking. 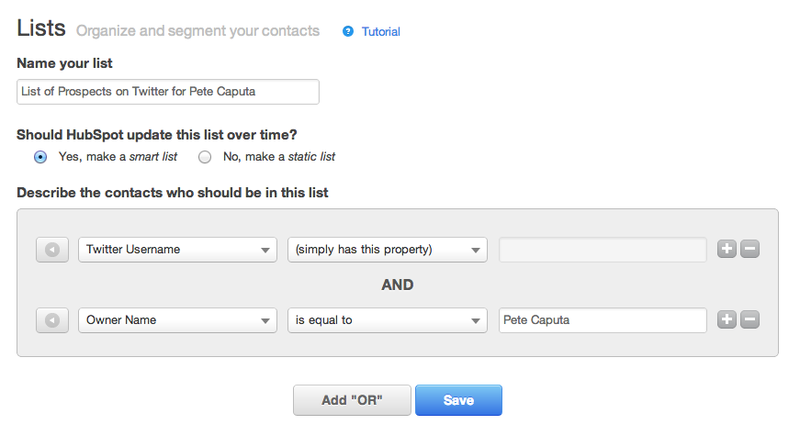 For HubSpot customers, one of the great features of our Contacts app is that we will automatically search for the Twitter handles of your contacts when they convert as a lead. This information automatically appears on the each contact record. You can easily create and export a list of your leads with known Twitter handles -- segmented out by sales rep -- to give your team a list of contacts relevant to them. From there, your sales reps could follow their leads, or create a list of leads to track. 1) Don’t abuse the @mention. I repeat, don’t abuse the @mention feature. Mentioning someone on Twitter is a great way to get them to notice you since your tweet will show up in their stream, but you want to make sure that they’re noticing you for the right reasons. Ask yourself -- are you offering them something valuable that’s relevant to them? If you haven’t talked to them in real life before, maybe drop in why your message is specific to them. 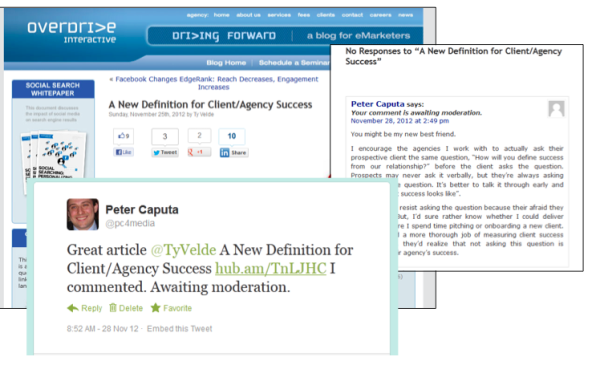 For example, “@HubSpot I downloaded your email template offer. Any brands you know of doing email design really well?” might be a good way to get the conversation going. Saying, "@HubSpot Can we schedule a time to talk more about the product I'm selling?" likely isn't. 2) Retweet their content with discretion. 3) Subscribe to their blog. Subscribing to a prospect's blog is a great way to find out what’s important to them and learn about what they’re working on. One tip for doing this if you use a Gmail account is to use a “+” sign in your email address when you subscribe, and route those messages into a separate folder. This is a little-known trick that makes organizing your emails super simple. For example, I subscribe to blogs using juliette+blogsubscriptions@gmail.com so that I can organize those messages in a separate folder by setting up a filter. Then, when I have a block of time, I can read all the articles in one sitting. With HubSpot’s software, you’ll be able to schedule your tweets in advance so you’re not blasting everything all at once. The goal for any sales rep is to convert a lead into a customer. Often, one of the steps on the path to doing that is establishing a good connection, whether it’s over the phone, email, or in a face-to-face meeting. One of the great things about using Twitter in your sales process is that it gives you a window into what’s important to your prospect and what’s on their mind at any given time. By utilizing Twitter lists, you can quickly scan what your prospects are saying each day to look for opportunities to start conversations -- either online or over the phone. By offering them relevant and valuable content, you can help establish yourself as a thought leader and stay top of mind for when they’re in their buying process. That way, when you do speak with them offline, you’ll be able to have a richer conversation based on their needs and how you can provide them with value. 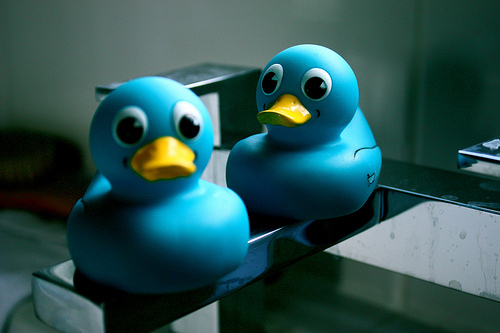 Do you use Twitter, or other social networks, in your sales process? Share your tips on integrating social media with sales in the comments!